A survey of the best high schools in the nation has been published by U.S. News and World Report, and several Chester County schools are highly ranked on the list of top Pennsylvania schools. The top 10 schools in Pennsylvania are: Julia R. Masterman Laboratory and Demonstration School (Philadelphia), New Hope-Solebury High School (New Hope), Northwest Pennsylvania Collegiate Academy (Erie), Upper St. Clair High School (Pittsburgh), Radnor High School (Radnor), Quaker Valley High School (Leetsdale), Great Valley High School (Malvern), Unionville High School (Kennett Square), Strath Haven High School (Wallingford) and Mt. Lebanon High School (Pittsburgh). At No. 8 on the list, Unionville High School was also ranked No. 670 in the nation and received a Silver Medal Award from U.S. News. The school has an enrollment of 1,334 students, with 93 full-time teachers. Students are ranked 96 percent proficient in literature, 92 percent proficient in mathematics, and scored a 47.2 in college readiness, based on state exit exams, AP and IB exams. Kennett High School came in at No. 32 in the state. It was ranked No. 1,307 in the nation and received a Silver Medal Award from U.S. News. The school has an enrollment of 1,251 students, with 77 full-time teachers. Students are ranked 83 percent proficient in literature, 76 percent proficient in mathematics, and scored a 34.0 in college readiness, based on state exit exams, AP and IB exams. Avon Grove High School in West Grove came in at No. 35 in the state. It was ranked No. 1,353 in the nation and received a Silver Medal Award from U.S. News. The school has an enrollment of 1,790 students, with 109 full-time teachers. Students are ranked 88 percent proficient in literature, 81 percent in mathematics, and scored a 33.2 in college readiness, based on state exit exams, AP and IB exams. Pennsylvania has 574 school districts, 673 high schools, 39,243 full-time teachers, and 591,438 students enrolled, according to U.S. News. The publication surveyed just over 29,000 U.S. public schools for the list. There were 216 Pennsylvania schools on the final list. 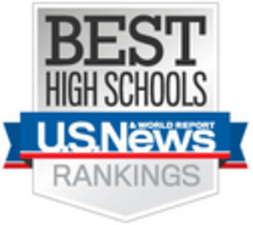 Topping the list as the nation's best high school is the School for the Talented and Gifted in Dallas, Texas. It has a total enrollment of just 253 students, with 17 full-time teachers. Students are ranked 99 percent proficient in English, 93 percent proficient in mathemetics, and scored 100 percent in college readiness.